Old Man Winter is about to take his leave. The end of the cold weather clears the way for the rejuvenating sunlight and warmth of the spring season. The sounds of snow-blowers and ice being scraped gives way to lawnmowers and the antics of children. New life being breathed into the greenery means it’s time to dust off the landscaping tools. Americans place more value on their lawns than any other country, collectively spending over six billion dollars a year on the various products used to cultivate a lively, green lawn. To have that perfect lawn in the summertime for enjoying lounging and barbecues, the process should start in spring. The damage that winter can cause to a lawn is unavoidable, but you can still take steps to have that perfect, lush lawn by the time you pull out the grill and spatula. And that means beginning as soon as possible. 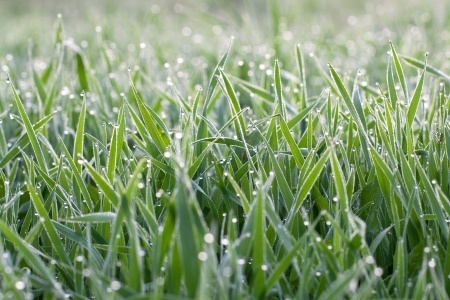 During winter, the cold temperatures and the fluctuations between dry and wet ground can cause a great deal of stress on the grass and soil. The sooner you deal with issues, the better. A very common issue is that of compacted soil. It’s very difficult for grass to take root when the soil is compressed, but there are some very tough species of weeds that can force their way in, and it can be hard to remove the entire thing when the soil is hard. To test how compacted the soil is, take a garden fork and poke it into the soil. If it doesn’t enter more than two inches without applying unreasonable force, you will probably need to get the soil aerated. You can use an aerator to take small plugs out of the ground (those little clumps of dirt that you probably thought were dog poop when you were a kid). You might also encounter issues with thatch in your lawn. This invasive plant can form a thick layer over the grass that makes it harder for it to absorb water and minerals. Thatch can be removed with specialized tools. If winter was particularly unkind to certain areas of the lawn, you might be left with unsightly “bald” areas that make the lawn look patchy or dead zones that are brown and brittle. Reseeding these areas can make for a dramatic improvement, but the problem could keep coming back if you don’t deal with the underlying problems. In addition to the aforementioned compaction problem, your soil might have a lack of nutrients that are essential for healthy grass. You can find out where you can have soil tested in your local area to determine what exactly is missing and what you need to add to correct it. You are probably well aware of the amount of care it takes to cultivate a healthy lawn. It’s crucial that you follow through with new grass that you plant to help it reach its peak potential. This means providing ample water and a good fertilizer. Mowing seems like a straightforward activity. When the grass gets long, you fire up the mower and make it… well, less long, right? To keep the grass as healthy as possible and avoid putting too much shock and stress on the lawn, it’s actually quite important to gauge the height of the grass and the amount of time between each mowing. While you may be tempted to cut it extra short to reduce the frequency of needed mowing, this can be a mistake. Shorter grass means the sun can reach more of the ground, and that makes it easier for the soil to dry out and for weeds to take hold. In general, you only want to remove about a third of blade length each time you mow. And don’t worry about removing the clippings, as they can beneficial for the ground. Giving your lawn that extra push in spring can make it even more beautiful and enjoyable by the time summer comes around. For more tips on lawn care, as well as other subjects, be sure to visit SnyderHomes.com, a builder of new homes in Williston VT.